Ed Lewis has the distinction of having created the Hollywood Walk of Fame cause-related marketing and licensing program. He developed this successful nationwide celebrity marketing program during his six year tenure as Executive Vice President of the Hollywood Chamber of Commerce. Some of his accomplishments include persuading over 300 famous personalities to participate in the Walk of Fame marketing program that enabled the Chamber to refurbish and preserve this world-famous Hollywood landmark. To officially recognize and thank these entertainers for supporting the marketing program Ed established the first-ever "Walk of Fame Reunion Awards Dinner" that featured many of the famous celebrities who have stars on Hollywood Boulevard. Following these achievements, he successfully produced a fundraising program entitled "A Salute to Famous TV Doctors" featuring the stars of "Ben Casey," "The Love Boat," "General Hospital" and "St. Elsewhere" for Riverside Community Hospital. The next year he exceeded his expectations with an event that he describes as "the thrill of a lifetime" that was "A Salute to The Stars of M*A*S*H" featuring Mike Farrell, Gary Burghoff, Bill Christopher, Loretta Swit, John Schuck and Larry Linville. 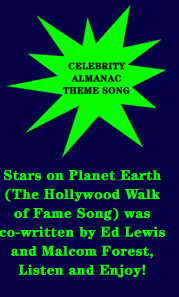 As a result of Ed's interest and creative abilities in working with celebrities throughout his career, he quite naturally conceived the concept of the Celebrity Almanac that he envisions as "The" celebrity information reference book. Designing the celebrity questionnaire data form and contacting the celebrities to get their participation in this exciting new venture proved fruitful. Over 300 celebrities responded to his request and many provided Ed with photographs and autographs for publication as well. Ed McMahon was so impressed with the project that he gladly provided the special introduction for the 1st edition of the Celebrity Almanac. Ed has a BA degree in Social Science and a Master of Science degree in Public Administration that he received from California State University at Los Angeles. One of Ed�s hobbies is staying abreast of both business developments and celebrity happenings in the entertainment industry. Also, he is very pleased that he is able to share his creative and technical skills in marketing with others as an instructor at two universities in Southern California. Click [ here ] to view pictures of Ed and friends! or click enlewis555@gmail.com to e-mail Edward.